Having some further thought on making the measurement framework, my overall idea is that this should be very accessible to a novice user either using the command line or the GUI. Simplicity is key. 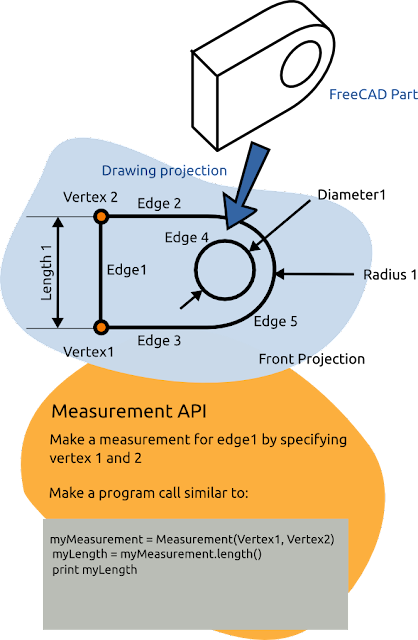 Specifically the user should be able to specify a set of geometric features: edge or points and the measurement framework figures the rest out - that's the plan atleast! This could be extended to gather more complex information such as surface area when specifying a face for the measurement or perhaps retrieving the moment of inertia or mass, for a given FreeCAD part. This builds up a quite complex cases, but what I think would be eventually be a good idea is to create an extensible approach, so that plugins could be called to provide extra methods when querying a set of features. This is over-kill at the minute, but could be interesting. Making use of measurements can be temporary, (whether in the command line or GUI). Using an object to store this information with reference properties means that these can be parametric hence update automatically. This means we should be able to pass this Measurement Object to a Dimension Feature and it can automatically create this and be absorbed into the Document. The Dimension Feature will be an Annotation Feature which will provide a more extensive coverage of options such as tolerances, dimension line type etc. These Dimension Features could in theory be used in the Drawing Module or in any other area of FreeCAD or atleast I would hope. Now it's time to shut up and time to start coding!